Updated Tuesday January 29, 2019 by Carolyn O'Leary. In 2019, May We Help will begin holding quarterly adaptive equipment swaps. The swaps will provide individuals and families a no-cost alternative to obtaining much-needed equipment that either takes years to get, insurance doesn’t cover, or is otherwise too costly to afford. Additionally individuals can use this equipment while waiting for their custom equipment to be ordered or received which can sometimes take 6-12 months. The idea is to leverage the inordinate amount of unused equipment that collects in people's basements and garages and give that equipment a second use, because – while it may no longer be right for one person – it’s likely a perfect fit for another! While we’ll be accepting donations of used equipment starting now, there’s no requirement to donate in order to take equipment home from the swap! Physical Therapist from Aspire Therapy Services will be on site to provide guidance to help individuals and families make the right selections. May We Help volunteers will be on site to provide fittings and other modifications. Kindness Couriers will be available before, during and after the swap to provide pickup and delivery of large or difficult-to-transport pieces of equipment (30 mile radius). 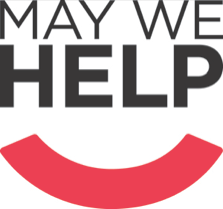 May We Help is now accepting new and used adaptive equipment.